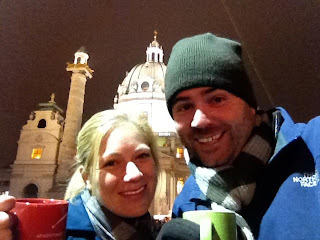 Happy as Mongoose: Winter Vacation Leg Two: Vienna! Moving on to the next leg: From Budapest, via train... to Vienna! I was so excited to go to Vienna. As in, no matter what we HAVE to go to Vienna. I have honestly wanted to go to this city FOREVER and it did not disappoint. It did take us a while to figure out exactly where our hotel (Hotel Mailberger Hof) was, but once we did and dropped off our stuff, can you guess the first place we headed? Of course you can!!! A Christmas market! This one was in front of Karlskirche, and had such a different vibe than the one in Budapest. It was much larger and had much more of a party feel to it. And it had *the best carousel ever. * Do you see that kid sitting in a birdcage? I mean, come on!!! How awesome is this thing!? From there we went to a recommended restaurant which was just okay, then we went to this darling cafe called "Cafe Museum" and indulged in the following: Sacher Torte and Apple Strudel. I couldn't believe it but Joe liked the chocolate torte better! Random Fact: Joe did not like bacon and liked chocolate in Vienna. This city was crazy-town. Anyway, at this point we were exhausted so we called it a night. The next day we walked all around the inner city and just admired the architecture. We also wandered through the Nacht Market, which reminded us both of Barcelona's La Boqueria and Seattle's Pike's Market. Is it strange that we both love the smell of fresh fish at these markets? I digress... after the market we headed to Stadtpark, where I not only got to pose with Johann Strauss, but I got to RUN-ACROSS-THE-PARP! Wheeeee!!!! This is generally what I looked like this entire trip - bundled up, map in hand. Next we found ourselves at St. Stephen's Church, which was incredibly impressive both inside and out. We took an elevator up the tower to see the bell and a view of the city. Check out the roof! For the record, neither of us where scared up here. Nope, not one of us. Not a person. After the church, we went to Mozart's apartment for a tour, then took a lunch break at Cafe Coffee Day, and then went to the Imperial Crypts. This was one of Joe's "must do" items, and I'm so glad we did it. Not only where the crypts eerily impressive, but I made a new friend! And then low and behold, another Christmas market! No mulled wine for me though... I think it may actually have started to run its course at this point. Gasp. It is so much fun to explore the markets - I tried not to miss a single booth because everything is so interesting. If only I could have tried everything... sigh. We went to a lovely Italian dinner at a restaurant called Italic, and then called it a night. We had to get up early for our tour of the Vienna Opera House the next morning. I wish we had been able to see an opera here, but now we have a reason to come back! At this point, in addition to being freezing cold, it was also pouring down rain. So Joe and I spent our remaining time in Vienna back at Cafe Museum. Once again, perfect. 1. I expected greatness from this city, and it delivered far more than I expected. 2. I want to go back in the spring/summer. Or to live. Either one would be just fine with me.